Deluxe SnackBox by UmshikBox This is our largest snack box, filled with over 40 items, 27 of which are unique including: Korean chips, candy, and other Korean snacks. Over FOUR pounds of snacks, drinks and bonus items! Midnight (or any other time) snacks Whether you need energy for gaming, studying or dancing to the latest EXO or Twice video, we've got you covered! Our Korean chips cookies and candy will reenergize you. Great gift for college students. They love our UmshikBoxes. Hmmm... then again; so do high school students, graduates, coal miners and our grandma Kathleen. Once you taste the treats in our Deluxe SnackBox, you'll know just why they love it. Calling all foodies Enjoy this really LARGE box full of spicy, sweet, soft, crunchy, crisp, light, rich and delicious Korean snacks, ramen and even a drink to sip along the way. We take great care to select items for this Deluxe SnackBox, and all food items are 100% Made in Korea. Military care package Looking for something to send to your loved one while they are far from home? Our UmshikBoxes are a great way to say, "We miss you." Note: Our boxes are not curated with allergies in mind. 4 POUNDS OF SNACKS Your Deluxe box is full of a variety of Korean snacks drinks and ramen because we all know that it's lame to feel hungry! BONUS ITEMS IN EVERY BOX Our snacks are absolutely amazing. Plus 4 bonus items: stickers, a milk carton pencil bag, two photo cards from renowned Kpop groups and some bling from our favorite Kakao talk characters! ULTIMATE GIFT FOR K-POP OR K-DRAMA FANS Not sure what your friend or child is talking about when they say things like bias-wrecker, comeback, being in an Army for BTS? That's ok, we do! Which is why we include K-pop merchandise in every box! NOT YOUR AVERAGE GROCERY STORE SNACKS You might find some of our classic South Korean snacks in your local Asian market. 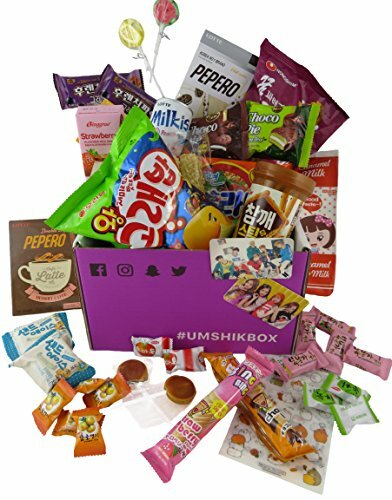 But, we always include some new and fun flavors or Korean brands that you probably haven't tasted before, unless it was in an UmshikBox, of course! If you have any questions about this product by UmshikBox, contact us by completing and submitting the form below. If you are looking for a specif part number, please include it with your message.